Australia's Waltzing Matilda is celebrated in Matilda Variations! released 2011 Musical Tapestries Inc.
Music for a G'day Productions/Musical Tapestries Inc.
Matilda Variations, the one-of a-kind solo piano work celebrating Australia, and based on its beloved song Waltzing Matilda, has hit the Australian airwaves: Australian Broadcasting Corporation's Classical FM and Public Radio Station 4mbs Classic FM. In December 2000, Laura commissioned New York composer Steven Rosenhaus to write a solo piano work based on Waltzing Matilda in honor of Australia for a concert she was invited to give at the New York Australian Consulate. Rosenhaus' work embraces the song's timeless spirit, cleverly weaving its way through an inventive group of variations. Delightfully subtle references to many great piano works are woven in--from a roster of composers that includes Bach, Mozart, Beethoven and Chopin. Along the way, Matilda Variations take an unexpected twirl--with a tango! Two variations-including the tango-can be heard right here. 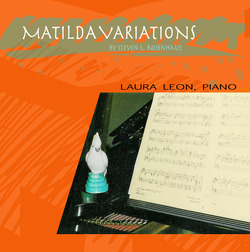 Since its premiere and original recording, Matilda Variations was rereleased in 2010 with new cover art design by noted cartoonist and illustrator Karen Leon. Her Australian-spirited lines and colors surrounds Laura's photo at the Steinway Piano of Rosenhaus' score with an Australian ceramic cockatoo-kindly lent by Dr. Peter Green, Director of the Celiac Disease Center at Columbia (www.karenleonartwork.com). It is also the soundtrack for Broken Tail Production's 2013 film of the same name, capturing the spirit of Australia through paintings by the exciting Australian artist Ian Banksmith. In addition to radio, a copy of Matilda Variations is in the Australian National Film and Sound Archive in Canberra--which collects, preserves and provides access to Australia's historic and contemporary moving image and recorded sound culture.